STEPANAKERT (Noyan Tapan)–At a press conference Thursday–Nagorno-Karabakh Republic foreign minister Naira Melkoumian stated that the current political order in the world is beneficial for the resolution of the Nagorno-Karabakh conflict. She explained that the existing conflicts around the world were being resolved based on the principle of ensuring security for the public. Furthermore–Melkoumian said that another guarantee for security was the international recognition of people’s rights. Melkoumian added that the independence of the Nagorno-Karabakh Republic was the greatest guarantee for security and because of this–the strengthening of Karabakh’s independence has found itself in Karabakh’s general foreign policy goals. The brunt of the press conference was devoted to an evaluation of the recently held summit of the Organization for Security and Cooperation in Europe convened last month in Istanbul. She said that the decisions and principles expressed at the summit will bring forth positive approaches to the Karabakh conflict resolution process. Melkoumian also praised a summit decision limiting the number of conventional weapons–adding that the provision does not change the current military status of Karabakh. The Karabakh foreign minister added that the document approved in Istanbul does not contain language regarding Azerbaijan’s territorial integrity. She added that Azerbaijan was not a democratic country–a reality echoed by numerous other states and international organizations. Melkoumian pointed out that the OSCE document specifically called for preservation of human rights in countries which have minorities. Given Azerbaijan’s non-democratic status–Melkoumian stressed–the territorial integrity issue will not receive much support from other countries. The foreign minister added that the Nagorno-Karabakh authorities view recent direct talks between Robert Kocharian and Haydar Aliyev as a positive step toward dispelling psychological obstacles and provide a new impetus for the resumption of peace talks within the OSCE Minks group framework. Melkoumian added that the Karabakh side should–as soon as possible–become integrated into the direct talks process. "We have stressed on countless occasions that without the complete involvement of Nagorno-Karabakh in the peace talks–the conflict resolution process will not yield the expected results," said Melkoumian–adding that the report presented by the co-chairmen of the Minsk Group at the Istanbul summit also echoed the same sentimen’s. Melkoumian stated that the decade-old anti-Armenian propaganda policy in Azerbaijan has created an atmosphere whereby Azerbaijan is unable–psychologically–to make any concessions. 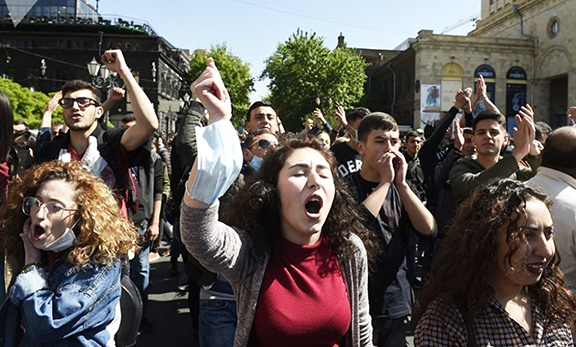 She pointed out that Aliyev himself is being pressured by opposition forces in Azerbaijan–thus becoming limited in making decisions and enacting them.